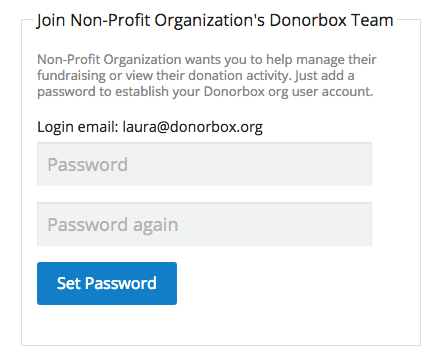 We have recently added a new “Team” feature that will allow you to invite other members of your organization to sign up for Donorbox in order to help you manage your Org account. This can also be helpful if you want to give accountants access to view your financials. To access this feature, go to your Donorbox “Account” page, and click the “Team” button on the left-hand side. The invited user will use the “Org Login” link on the Donorbox homepage to log back in on future occasions. Please note that invited team members cannot modify Stripe and PayPal settings or change the main account login email. Read-only access to certain team members should be available in the near future. 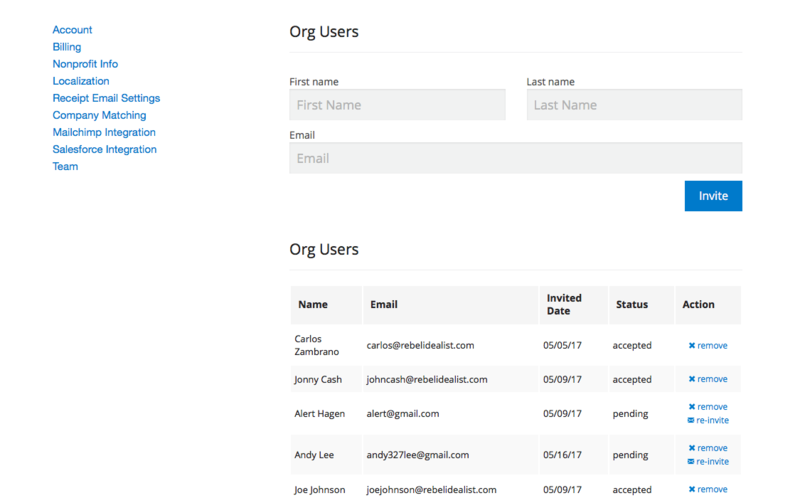 Back on the “Team” page of your Donorbox account, you can access the list of users connected to your organization, as well as their email address, the date they were invited, and their status (whether they have accepted the invitation, or if it is still pending).